Our weekend dog park is always supervised by Stone Mountain Pet Lodge staff to promote safety and fun for all owners and dogs. The indoor/outdoor dog park at Stone Mountain Pet Lodge on Baltimore Street is a great way to enjoy warm weather (or escape the winter chill) while still properly exercising your dog. We have all the same benefits of an outdoor dog park and all the socialized fun plus the benefit of shelter from the elements! Upon entering Stone Mountain, sign/check in at the front desk and pay a low fee of $10 for as much time as you’d like to stay (between the assigned hours, of course). You will have use of the indoor playroom and outdoor play yards adjacent to the facility. The indoor/outdoor dog park will be available most Saturdays from 1 PM to 4 PM. If an event comes up that requires the use of the room, the park will be closed. To ensure that you do not show up on a closed day, you may check the dog park schedules that will be posted at the front desk, or you can call 763-600-6019. 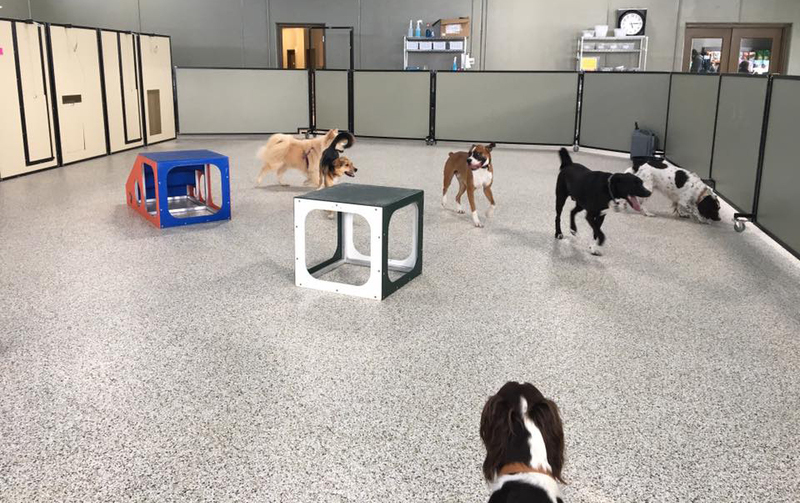 The indoor dog park at Stone Mountain Pet Lodge in Brooklyn Park Xenia is a great way to enjoy warm weather (or escape the winter chill) while still properly exercising your dog. Our brand new facility is loaded with FUNiture equipment and toys for indoor playtime. Bring your dog in and get to know the people in your community while you socialize your pet. The indoor dog park will be available most Sundays from 1 PM to 4 PM. If an event comes up that requires the use of the room, the park will be closed. To ensure that you do not show up on a closed day, you may check the dog park schedules that will be posted at the front desk, or you can call 763-493-2003. Owners will be responsible for their dog’s behavior and cleanup while using the dog park. Dogs will not be split up into groups, so this is the same as any other dog park. We reserve the right to ask unruly participants to leave due to the disrespect of others or Stone Mountain property and employees. Owners will need to have verification of current Bordetella, Rabies and Distemper vaccinations in order to participate. Females in heat and un-neutered males (older than 6 months of age) are prohibited. Each participant must sign a waiver to remove liability from Stone Mountain Pet Lodge and its staff.